Mother Nature can be harsh and unleash some of the cruelest weather. In addition, indoor trampolines aren’t always top notch. When it comes to both cases, heavy duty trampolines exist to save the day. Heavy duty trampolines are tougher and last longer compared to a regular trampoline, regardless of whether it’s an indoor or outdoor trampoline. They’re made of tougher materials, can withstand harsh weather, and are designed to support a higher weight capacity. Whether you’re looking for a new heavy duty trampoline with enclosure for your backyard or a heavy duty mini trampoline for exercise, here are the top 5 heavy duty trampolines that you can choose from! The Trampoline All-in-One Combo Set by ExacMe has a price range of $220 up to $496, which will depend on the size of your choosing. The sizes available are from 8’ all the way up to 16’. Regardless of the size, all trampolines are certified by the TUV, tested by the GST, and have UV approval. Each size comes with a full net enclosure, a safety pad, and a ladder, as well as 6 W-shaped legs, 12 balanced contact points, and steel brackets. This design has proven to be stronger and more safe when compared to trampolines with 4W or 5W legs. However, 8’ models only use 3W legs and 10’ models use 4W legs. The frame is constructed from galvanized steel for heavy duty stability and heavy gauged 7” springs, both resistant from rust. For models over 12’, the weight limit is a category-leading limit of up to approximately 400 pounds. The enclosure netting extends higher than the majority of heavy duty trampolines out there, also made of high density PE material. The wide-tooth zippers ensure that they will last and won’t jam. 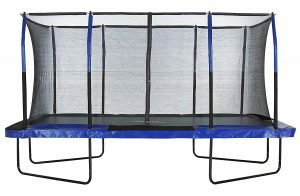 The Trampoline and Enclosure Set by Upper Bounce will run you between $197 and $414, ranging in sizes from 7.5’ to 16’. For this review, we’ll be focusing on the 10’ model. Each comes with enclosure poles that are incredibly easy to assemble and disassemble whenever required, without the need for complicated hardware. It has a high-quality jumping mat that is made using premium PP mesh material with 8-row stitching for added stability against wear and tear. The 10’ model uses 4 heavy duty W legs, has a maximum weight limit of up to 330 pounds, and is made with a rust-resistant galvanized, powder-coated steel frame. The frame has a featured joint that is welded to have an opening on each leg to ensure that they are as stable as possible. The thick foam protector is 1” thick with a PVC coating and a strong enclosure net with foam sleeves that are resistant to both UV rays and water. The enclosure net features closures with zippers and buckles to ensure that no one is able to fall out and potentially harm themselves, made from 100% premium Terylene mesh material. It also features a design that boasts small, minimal gaps between the net and the jump surface. The netting is attached to the jump surface using V-ring spring clips, which pair well with the edges reinforced with double the material for a long lifespan. The heavy duty trampoline springs are crafted from galvanized steel, designed to increase bounce for maximum fun. They are resistant to cracking and won’t break during the coldest weather. 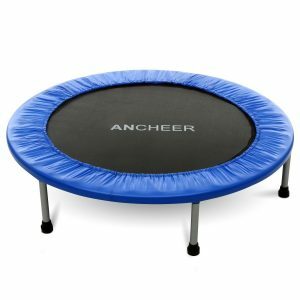 The Fitness Exercise Trampoline by ANCHEER is a cheap heavy duty mini trampoline, coming in at only $93. It has a foldable design with a 40” jump surface that can be folded over, making it easy to carry and even easier to store. The balance handle has an approximate 36” foam handle for added balance, perfect for performing poses and keeping proper posture. 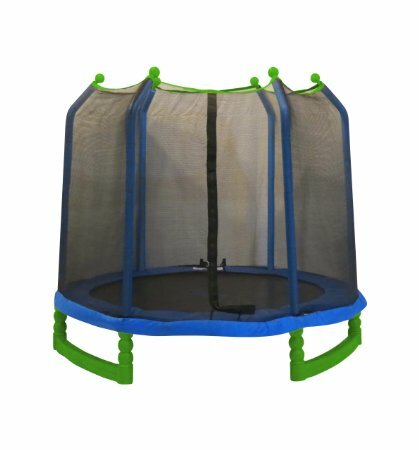 It’s supported by a total of 8 legs made of 8” steel with rubber tips, and a PP jumping mat that allows you to bounce higher than a typical exercise trampoline. It has a maximum weight limit of up to 300 pounds with 40 stainless steel springs, designed for super elasticity and a longer life. Included is a thick oxford cloth material abrasion that protects your feet from the metal frame and the springs. The 15’ Trampoline With Enclosure Net by ORCC is currently priced at approximately $320. 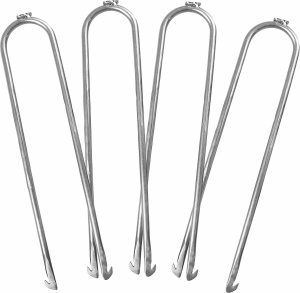 It uses 6 U-shaped wind stakes and a heavy duty, rust-resistant, galvanized steel frame. It has a total of 108 heavy gauged, 7” galvanized springs, making it more secure, comfortable, resistance to rust, and gives a better stretch than most heavy duty trampoline springs. 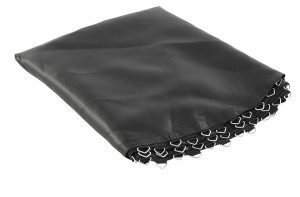 The jumping mat is made from a heavy duty, UV protected, polypropylene material and uses a PE+PVC foam protection pad that fully covers the springs and the frame. The trampoline has a maximum weight limit of up to 330 pounds, with pole sleeves for the net enclosure poles to ensure that no one will hurt themselves if they jump against the steel poles. The enclosure netting is made from a high-quality polyethylene material with UV protection. The trampoline also comes with a rain cover, the enclosure netting, and a heavy duty galvanized steel ladder. The Rectangular Trampoline With Fiber Flex Enclosure by Upper Bounce is priced between $630 to $700, depending on the size you choose. 8×14’, 9×15’, and 10×17’ are the available sizes, at this time of writing. For this review, we’ll be focusing on the 9×15’ model. The frame is constructed using heavy duty steel, coated in black for color, for added durability. The socked are welded onto the frame to hold the poles for the upper area of the net enclosure, which prevents twisting of the frame and adds a better connection for the overall construction. The jumping mat is made using premium PP mesh with 8-row stitching for less wear and tear over a period of years. It has a maximum weight limit of up to 500 pounds, mostly thanks to the rust-resistant, heavy duty galvanized springs. 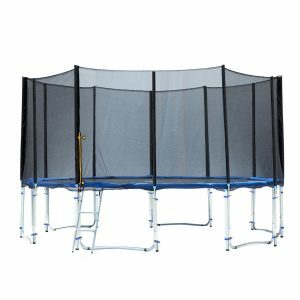 Like the previous Upper Bounce heavy duty trampoline, this one also uses the no-gap enclosure netting system with dual zippers and the latch clips to match. The safety pad is also foam and 1” thick, as well. The Fiber Flex enclosure system runs through the enclosure’s top ring, enhancing the look of the entire trampoline. Just like before, this section will give you a close look at the top 3 heavy duty trampoline accessories, which help maximize the life of and enhance your heavy duty trampoline in important ways. Every heavy duty trampoline needs heavy duty trampoline anchors. The Heavy Duty Trampoline Ground Anchor Kit by Pure Fun is incredibly cheap, priced at approximately $19. There are a total of 4 anchors in the kit. The anchors are an extra wide size with a total width that fits most brands and models of trampolines, typically with a leg base of up to 3”. They are crafted from rust-resistant galvanized steel that hold up well against the weather elements and are sure to last for years. Their tapered ends go effortlessly into the ground, with hooks that prevent the stakes from backing out once inserted. The flat, welded surface makes striking them with a hammer as easy as possible to do. Having a set of extra heavy duty trampoline springs on hand is always a good idea. 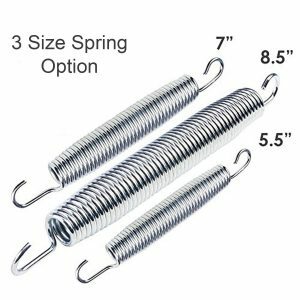 Thankfully, the Heavy Duty Galvanized Steel Replacement Trampoline Springs Set by GC Global Direct is $20 for 20 7” springs, $30 for 20 5.5” springs, and $34 for 20 8.5” springs. Each spring is highly durable, highly tensile, rust-resistant, and able to stand up to the harsh, cold weather elements. Even in the coldest winter, they will not crack. Each spring is made of heavy duty galvanized steel wire. Having a spare trampoline mat on hand is never a bad idea. The 12” Round Replacement Trampoline Mat by PARTYSAVING costs only $44. It fits 14’ heavy duty trampoline frames with up to 72 rings and is made from premium heavy duty polyethylene weaved UV-resistant mesh material. The design ensures that wear and tear takes years to happen. The heavy duty trampoline mat has durable, thick rings are made of galvanized steel with ring connection straps that are reinforced for the best secure connection to the frame and the rings. Even though heavy duty trampolines tend to cost more than a typical trampoline, they are worth their weight in gold when it comes to being worth the investment. They last a heck of a lot longer than a traditional, weaker trampoline will. If you don’t see your question listed below in our FAQ section, get in touch with us and let us know! Are heavy duty trampolines better than regular trampolines? Yes, they most definitely are. Heavy duty trampolines have increased weight limits, are made of stronger materials, and last much longer than your standard, regular trampoline will. Are there any heavy duty exercise trampolines? Absolutely. Where indoor trampoline exercises are concerned, they are well worth the investment and will last much longer than a weaker one designed for the same type of use. If you want to see one for yourself, feel free to scroll up to our heavy duty trampolines section to view one. 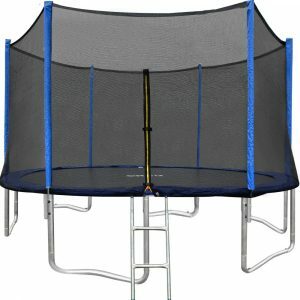 Are heavy duty trampoline replacement parts cheap? 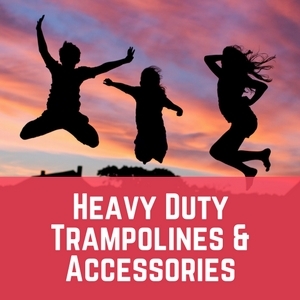 Typically, you can easily find cheap replacement parts for heavy duty trampolines on your own, but you can also view some of what we have above in our top heavy duty trampoline accessories review section to get an idea of what replacement parts you will probably need in the future.